About The Map: This is the story map, and it is rather unusual. As you can see, it combines all of the maps from the other layers. It also includes two sorts of stories: the written ones that have already featured on the travel layer, and spoken ones. In reality, there is a Native oral story for each of these places. The eleven featured here are either Métis-specific, or they are First Nations stories that Métis also retell, usually those of their own relatives. Stories Of Our People, Lii Zistwayr Di La Naasyoon Di Michif from the Gabriel Dumont Institute is an excellent example of this. All of the stories were recounted by Elders. Since my First Nations relatives are eastern people, you'll find that a story or two has been tidily transplanted west. The written stories can usually be accessed by clicking on the green text. The eleven spoken stories go with these eleven places: Saanich, Amiskwaskahikan, Luwe Chok Tuwe, Kinuk Siskatai, Chutes De La Chaudière, Mochk-Kinstsis, Katarowki, Estipah-Skikini-Kots, Katepwe, Montaignes D'Aigle, and Montréal. 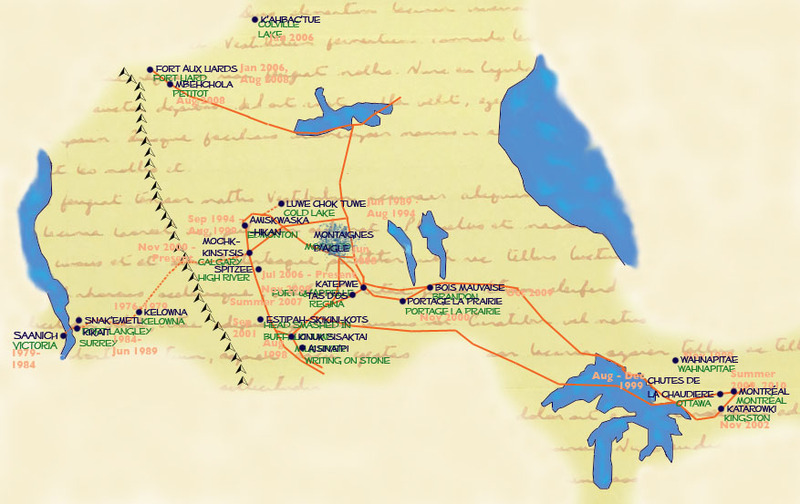 Métis Stories: One of the most striking features of the Métis stories I found apart from my own store of them was that once again, there was nothing about a "people in between." Some stories deal with being distinct, certainly. Yet in each case, the story usually makes clear that distinctness is not an issue for the Métis or the other natives they may live with or be related to. The times when Métis do get into trouble, as would any native person, is when we fail to be good relatives. Anyone who had been imprisoned in residential school, heavily missionized in other ways, or brought up outside of a native cultural environment could be manipulated or convinced to act as a terrible relative indeed. Such acts are understood to be non-Métis specific, although on average more Métis start out in non-Native cultural environments, and so can run into trouble as they start to reconnect with their native relatives. I would have liked to include some stories here that showed this, apart from any I might tell myself. However, the journey of researching and building this website has shown me that it may still be a little too soon. Some of the pain is too fresh for people to tell those stories. Somehow I have a feeling they will start to come out soon, as they already have a niche to fit in, that of indirect criticism. If you've ever listened to First Nations Elders who are also treaty, you will likely get to hear them carefully, rigorously, and indirectly critique whatever authorities they are dealing with by telling stories about the true spirit and intent of treaties. In my current line of work, I have had the good fortune to hear such stories often enough to learn something, almost in spite of myself. Not so long ago, something important about the telling of these stories struck me. They work just as the Apache Elders at Cibecue point out, the stories work on you, they work on your mind and so you learn from them. This was also pointed out to me by an anthropology professor at the University of Calgary, Barb Wilkes. The stories work even when the listener insists they have no idea why the story is being told, or that they're too tired to work on the issue just then. Watching my colleagues squirm uncomfortably as the Elders present their critiques of Canada's behaviour towards Native people, now I get it. Those stories are working on them, and me too, and whenever any of us go back to the place we heard them, we'll think of those stories again. And in spite of ourselves, we'll learn something.